We truly pride ourselves on being engaged in the Telluride community and giving back. ONE TO ONE MENTORING was founded in 1994 by John Mansfield and Allan Gerstle, who were serving in Juvenile Diversion and Social Services at the time. They saw the opportunity for a youth mentoring organization to address the needs of at-risk youth in San Miguel County. Since its inception twenty-one years ago, the program has served hundreds of youth throughout the county. Presently, the opportunities addressed through the organization’s programs continue to focus on at-risk youth but have expanded to include a diverse array of needs, such as youth experiencing gender issues, grief, chronic health issues and a need for companionship. TREC broker and Vice President Dan Henschel has been involved with One to One Mentoring since its early days as a mentor, and now serves as President of the organization. “I’m still friends and in touch with the child I mentored and am proud to say that he’s gainfully employed, drug free and only drinks socially. It’s proven that mentoring works. I have seen firsthand how One to One and our adult mentors can positively affect children whose odds are oftentimes stacked against them,” said Henschel. Started in 1979, Telluride MOUNTAINFILM is one of America’s longest-running film festivals and a locals’ favorite. Sage Martin, wife of Broker Alex Martin, is its Executive Director. Through the years, in and out of trends and fads, the festival has always been best described by one unchanging word: Inspiring. Mountainfilm has evolved into a dynamic organization and a festival of films, people, stories, and ideas that celebrates indomitable spirit, educates and inspires audiences, and motivates individuals and communities to advance solutions for a livable world. Mountainfilm has grown from an annual weekend festival to a year-round and worldwide experience. Mountainfilm on Tour takes a selection of festival films on the road. Mountainfilm believes that school-age children are the most important audience they can reach. The Tour visits K-12 schools across the country where they can screen films free of charge for students. Through the tour, Mountainfilm touches the lives of some 65,000 people every year and visits more than 120 locations on five continents. In the interest of helping important stories be heard, the Mountainfilm Commitment Grant awards five $5,000 grants annually to filmmakers, artists, photographers and adventurers whose projects are intended to move audiences to action on issues that matter. “Alex and I are so blessed to have the opportunity to live and work in Telluride. The natural beauty is awe-inspiring, and the community genuine. We couldn’t dream of a better place to raise our sons and to call home.” says Sage. In 1995, the TELLURIDE ADAPTIVE SPORTS PROGRAM (TASP) became an independent non profit and an organized chapter of Disabled Sports USA, a national network of sports and education programs for people with disabilities. TASP was predominantly a winter program until 2001 when horseback riding was introduced. Today, TASP has a wide variety of activities including skiing, snowboarding, ice climbing, snowshoeing, horseback riding, river rafting, kayaking, cycling, jeep tours, hikes and day outings, working closely with other adaptive sports programs and local guides and outfitters. TREC Broker and Vice President Jim Nerlin has served as a Board Member of the Telluride Adaptive Sports Program for nearly 10 years. TASP Executive Director Courtney Stuecheli praises Jim’s long-term commitment to the organization, saying, “Without Jim’s leadership and generosity, many of TASP’s programs would not be where they are today.” Jim was an active member of the finance committee and worked diligently to grow the organization’s reserve funding Sharing the love of sports with those with disabilities and operational budget so that they could offer sustainable year-round programming for individuals with disabilities. Jim actively participates in TASP fundraising events and helped the organization by introducing new Telluride and Mountain Village homeowners to the TASP community. Jim’s connections in the real estate world have proved helpful in securing donated lodging for disabled veterans programs, which host over 100 veterans with disabilities each year for all-expense-paid adventure weeks here in Telluride. Since 1975, KOTO COMMUNITY RADIO has provided the Telluride region with high-quality, commercial-free, non-underwritten community radio. Listener-supported KOTO’s radio mission is to entertain, educate, and inform while reflecting the needs, desires, and diversity of our community. Tune in and you might just hear TREC brokers on the airwaves. Brokers Mark Dollard, aka “Random Factor,” Terrie Dollard, aka “Trolley Dolly,” Tom McGlade, aka “Hedgehog,” and Broker/Vice President Toby Brown, aka “Rockin’ with T. Brown,” are all volunteer DJs. “As an avid music fan, I have loved listening to KOTO since I arrived in Telluride. As a kid who always dreamed that being a DJ was the greatest job in the world, KOTO made that dream come true for me. Now as a board member, I believe passionately in preserving KOTO as the cultural and artistic gem that it is, and for the critical public service that it provides for our community. KOTO rocks!” says McGlade. TREC Broker Chris Sommers has served the TELLURIDE ASSOCIATION OF REALTORS as the Multiple Listing Service Director for the last two years. In this role, he oversees a committee that regularly evaluates current practices and recommends and implements updates, giving sellers and buyers confidence that property listing information and the way it is conveyed to the public is as accurate and complete as possible. TREC Broker Pam Guillory serves as the Educational Chair. Every broker is required to take continuing education credits each year in order to maintain a real estate license. Pam and her committee research and evaluate education programs to make sure our brokers are receiving the best educational opportunities. In her TAR leadership role, Pam also volunteers for Senior Luncheons, Adopt-A-Highway and Angel Baskets. TREC Broker Steve Patterson has been elected Treasurer every term since 2004. With over a decade of experience, Steve advises the Board in areas that concern the financial position of the Board. TREC President and Managing Broker TD Smith is currently the Past President Liaison. He was the first President to be elected to TAR and has served on the Board of Directors in his career. With his ample experience, TD provides input to the Board of Directors. He assists the President by every means possible to assure the successful completion of the plans and programs of TAR. In 2007, TD was the recipient of the Lifetime Achievement Award. He also volunteers his time with Adopt-A-Highway. In addition, below is a small sampling of other volunteer positions and affiliations held by TREC owners, brokers, and staff. 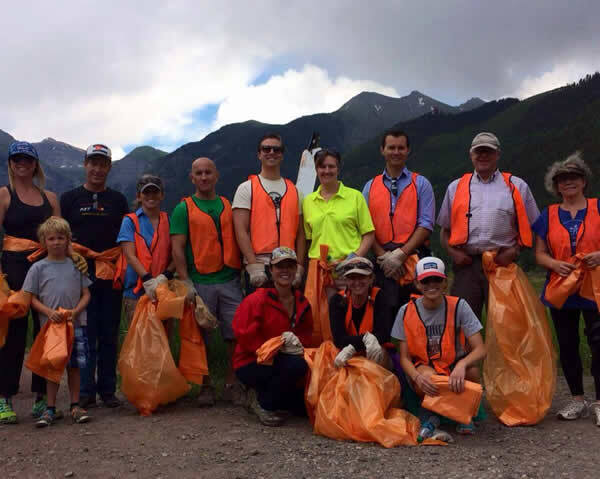 Telluride Real Estate Corp. prides itself as a company that volunteers and contributes to the Telluride region to make our community a better place to live and work, including our involvement with the Adopt-A-Highway Program.